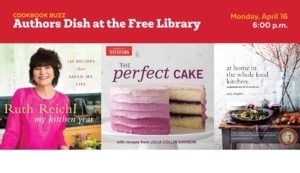 Spend an evening at the Parkway Central Library dishing with some of your favorite cookbook authors and get the inside scoop about the newest, upcoming cookbooks. Tickets are $10 and can be purchased at freelibrarycook.eventbrite.com. All attendees will receive a free recipe book that includes recipes from Ruth Reichl's My Kitchen Year paired with the perfect audiobook and other goodies. This program is presented by the Free Library's Culinary Literacy Center in partnership with Borrow. Read. Repeat from Penguin Random House. For more details, email kitchen@freelibrary.org or call 215-686-5323.